The gap between strategy and the execution of that strategy is often referred to as “strategic dissonance” and is generally called “strategic stress.” The “Yerkes-Dodson Law” which has been used in this research, examines the relationship between stress and individual performance. It shows that stress increases performance up to a certain point, but not beyond that point. By that metric, “strategic stress” can improve a company’s performance – up until a point. Strategic Burnout (too much strategic stress). Excessive strategic stress is typically a result of one or more of the following causes: (1) Too much autonomy, i.e. employees who follow their own agendas at the expense of corporate alignment (2) unrealistic strategic plans, i.e. the organization’s inability to live up to the plans put forth by top management, and (3) market dynamics, i.e. external developments that push the organization in other directions than initially planned. When strategy execution moves too far away from the initial strategy, the link between the plan and reality is broken, resources are wasted, and the organization lacks guidance. This scenario is characterized by divergent projects, fragmented activities that have little in common with the initial strategic plan, and projects that do not fit together. The outcomes of such an anarchy are random, unpredictable, and such organizations experience strategic burnout. Strategic burnout can occur if prophets & experts – employees who enthusiastically work on projects outside the predefined strategy, dominate the organization without the counterweight of executors & gamblers – employees who drive projects related to the planned strategy (executors implement low-risk strategic projects, and gamblers bet on high-risk projects that are within the confines of the predefined strategy). Strategic Boredom (not enough strategic stress). When strategy execution aligns perfectly with initial plans, the organization does not experience sufficient strategic stress and this results in strategic boredom. The concept of strategic boredom does not necessarily suggest that the contents of a strategy are boring. It means that conformity and limited challenges give rise to risk of strategic complacency, which may result in rigid execution that is blind to emerging risks or opportunities. Strategic boredom can occur if executors & gamblers dominate the organization without the counterweight of prophets & experts who push for new ways to drive the business. 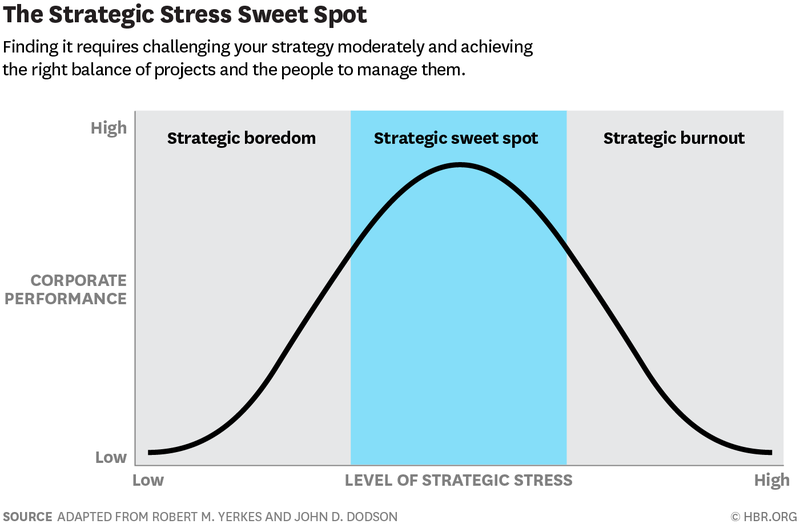 Strategic Sweet Spot (just the right amount of strategic stress). When strategy execution differs moderately from the initial plan, the organization is in the strategic sweet spot. This scenario is characterized by a sufficient balance between alignment and nonconformity, which is needed to ensure strategic success. The sweet spot can be reached if there is a balance among the four project-manager types: executors, experts, gamblers, and prophets. The optimal amount of each will depend on the specific organization as well as situation, and on changes in technologies, customer needs, and/or the competitive context. Adopt a mindset for stress: Make sure that you do not view strategic stress as a problem from the outset—you should want your strategy to be subjected to some amount of stress. Therefore, emphasize the value of both challenging and executing a strategy when communicating with your employees. Set up for stress: Proactively think about how emerging autonomous projects can influence your strategy and its execution. Build structures and processes in the organization such as hackathons and innovation days that provide one-day bursts of autonomy, to enable employees to experiment with alternative projects. By providing a clearly limited space for employee autonomy, you can ensure that you won’t step into the “too many different projects” pitfall, potentially leading to a strategic burnout. Diversify for stress: Employ a mix of people, so that your organization can carry out different projects, some of whom focus on executing the strategic plan and others who challenge that plan. Strategy making involves both the deliberate execution of intentional plans and responsive actions to emerging issues. Both activities are necessary to ensure strategic success and corporate longevity. Therefore, your strategy needs a level of stress that pushes you to cope with the gap between the plan and its execution. The team at Actuate Business Consulting, a knowledge based management consulting firm in India, believes, that too much stress to a strategy can be detrimental. At the same time sufficient amount of strategic stress ensures that an organization moves forward efficiently. This also keeps the organization alert and responsive to emerging developments. The challenge is to find the sweet spot whereby employees challenge the strategy, while not moving the organization too far away from its original strategic domain. Just like a diamond is the valuable outcome of constant pressure from multiple sides, strategic success results from balanced pressure on a strategy.